Our second day in Thailand started early. 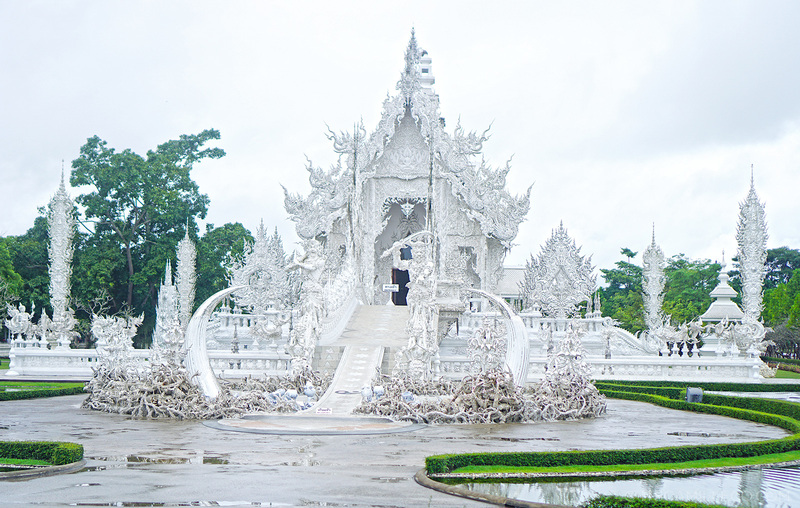 We were scheduled to go out of the city and head to Chiang Rai to visit its White Temple or Wat Rong Khun. 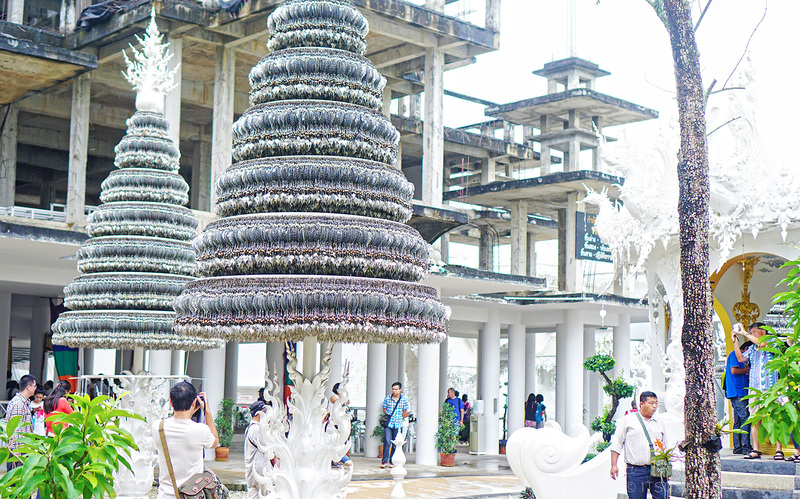 The famous Buddhist temple was designed by Thai national artist Chalermchai Kositpipat in 1997 when the old structure’s restoration works had to be halted due to lack of funds. 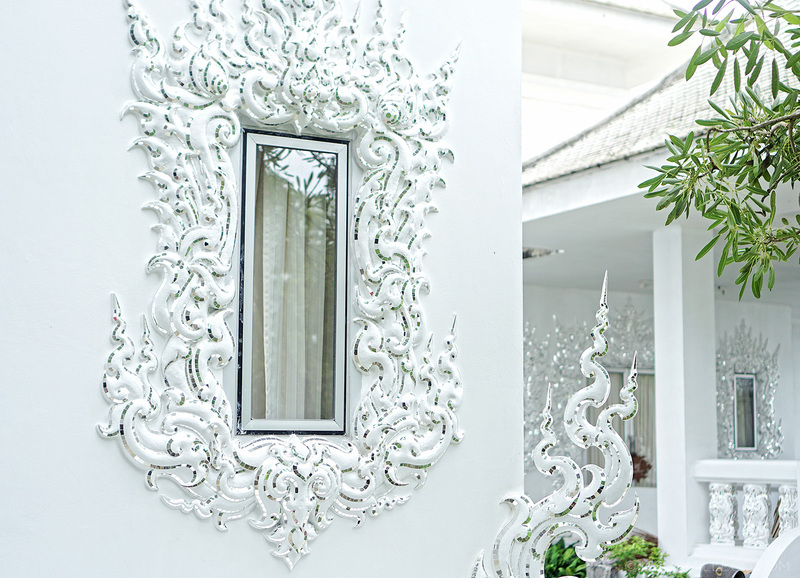 Chalermchai decided to take on the project and completely rebuild it using his own money. 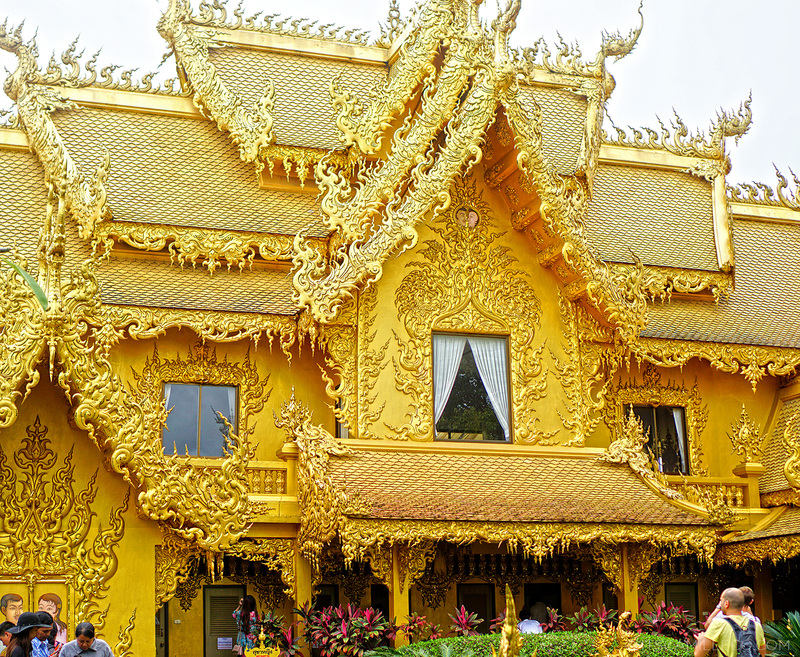 He anticipates that the structure wouldn’t be finished in his lifetime because the plan is to build 9 intricately designed buildings that include an ubosot (chapel), pagoda, hermitage, crematorium, monastery hall, preaching hall, museum, pavilion, and rest room facilities–all of which will be built on an area of about 3 acres. 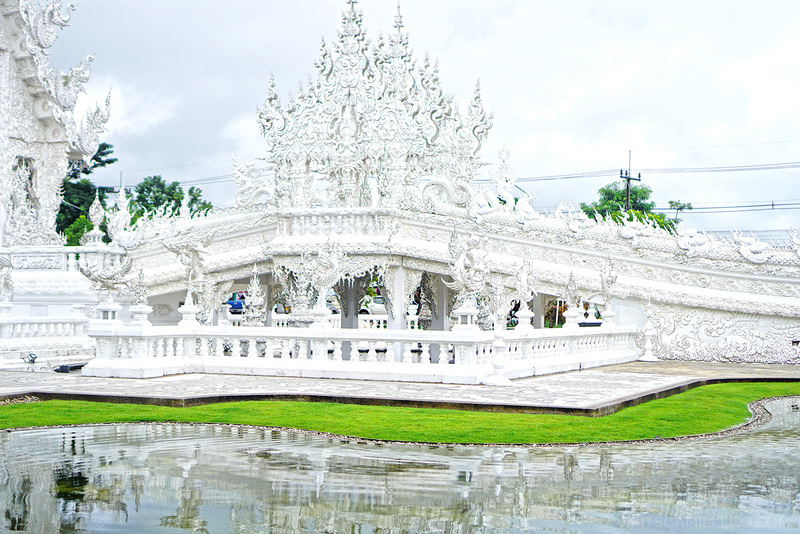 Needless to say, construction is ongoing until now but the White Temple already looking as magnificent and magical as can be. 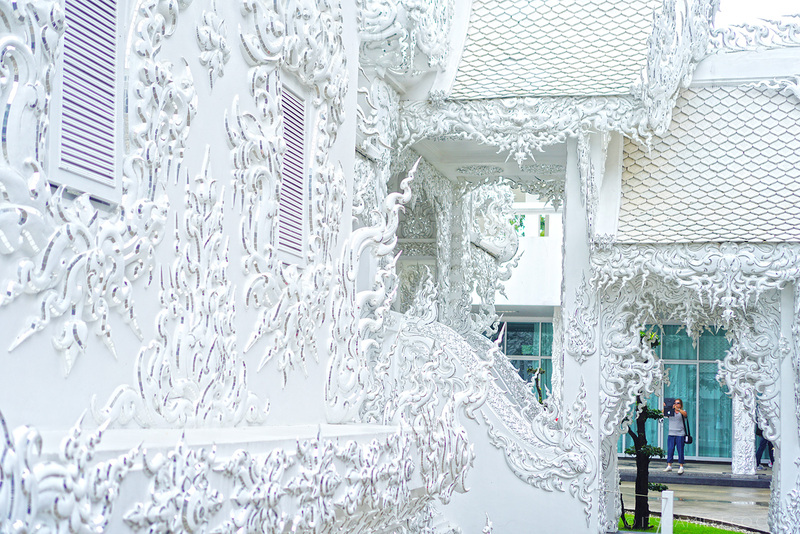 Every little detail of the White Temple is meaningful. 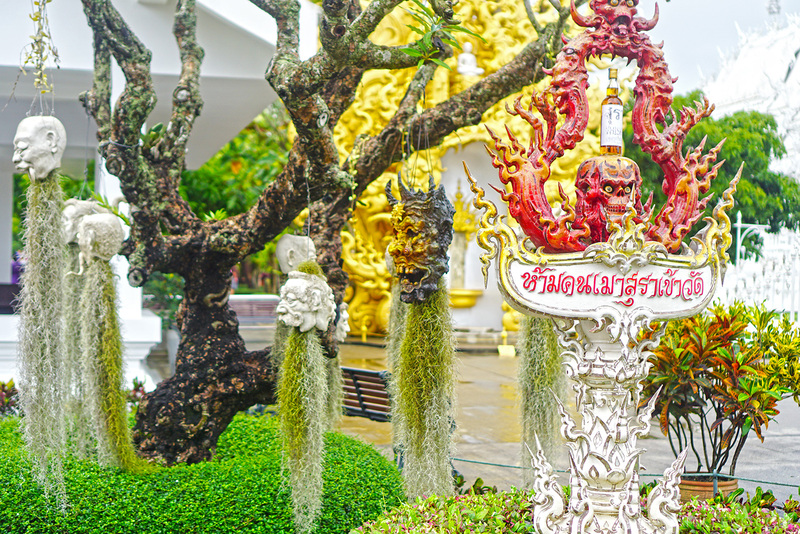 Chalermchai, a devout buddhist, made sure that visitors would be encouraged to reflect on Buddhist teachings that focus on the mind and discourage worldly temptations, desires and greed. 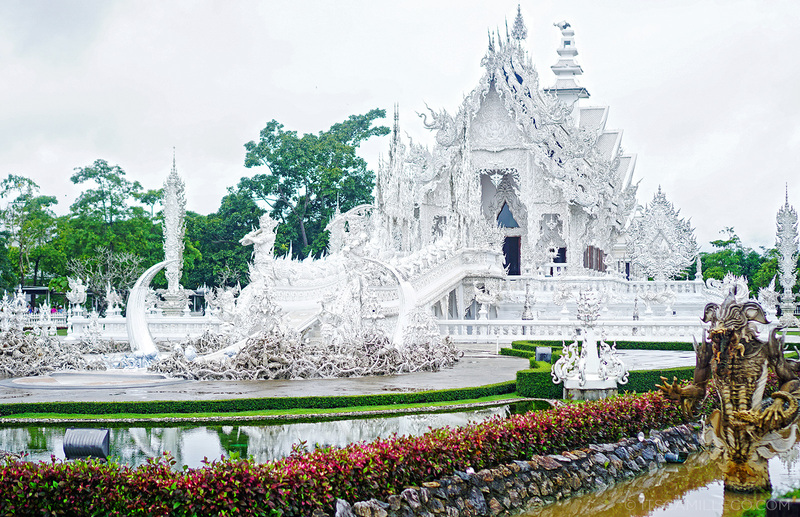 His approach, however, is what makes the White Temple so unique. 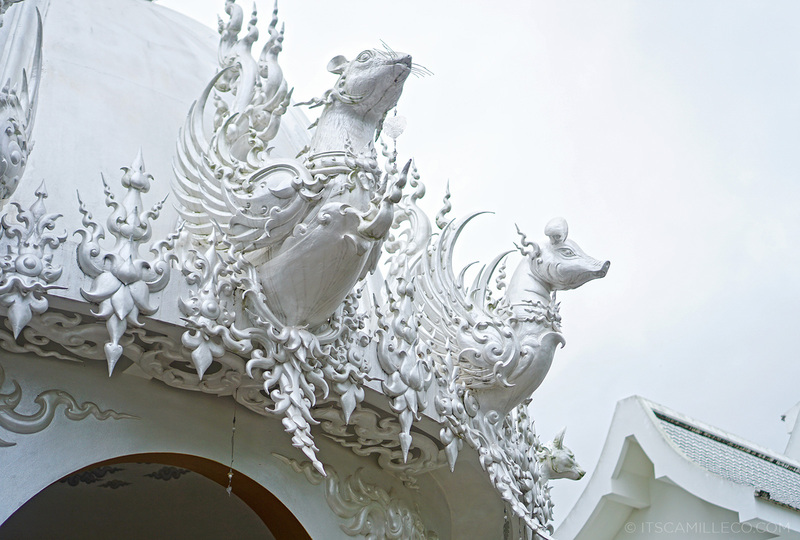 He mixes traditional Thai architecture with modern and fantastical elements. 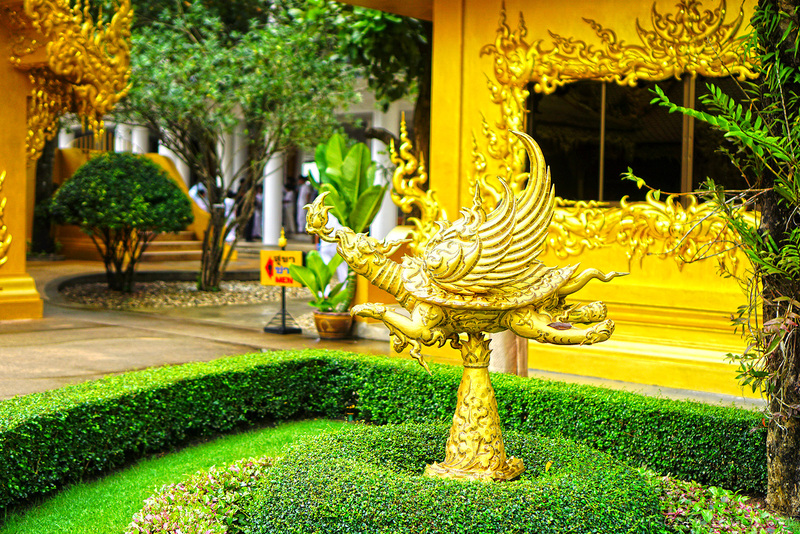 It’s most apparent when you enter the main temple. 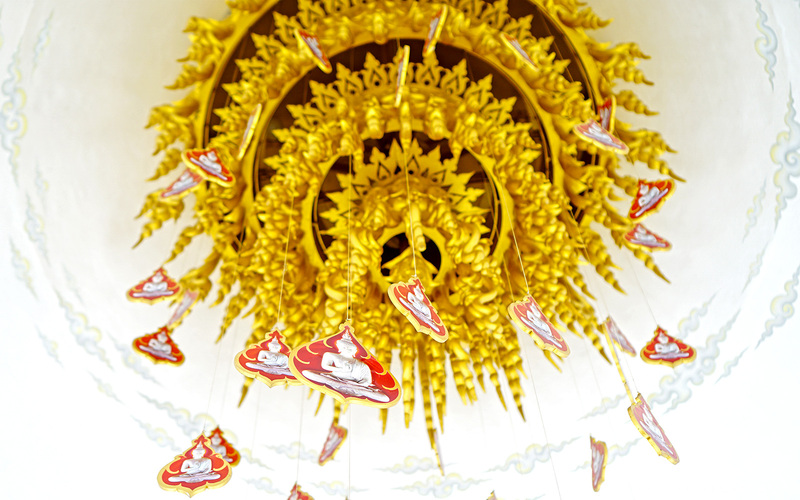 Chalermchai incorporates contemporary manifestations of good and evil in depicting traditional Buddhist motifs. Instead of the usual heroes and demons, murals of Batman, Superman, Spiderman, Predator, the Matrix’ Neo, warfare, the Twin Towers and even Elvis decorate the hall. I wish I saw them first hand but it was (surprise surprise) raining again when we got there so the main temple was closed. I could only take photos of it from the outside. What a pity. 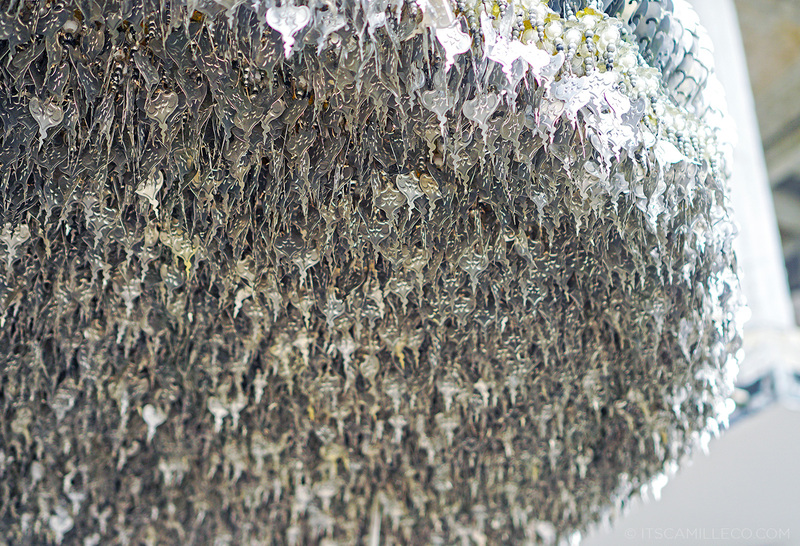 I really wanted to walk across its bridge built over hundreds of out-reaching hands that symbolize desire. It looked so eerie in pictures! Oh well, maybe next time. Seeing the main temple from the outside is good enough for now. 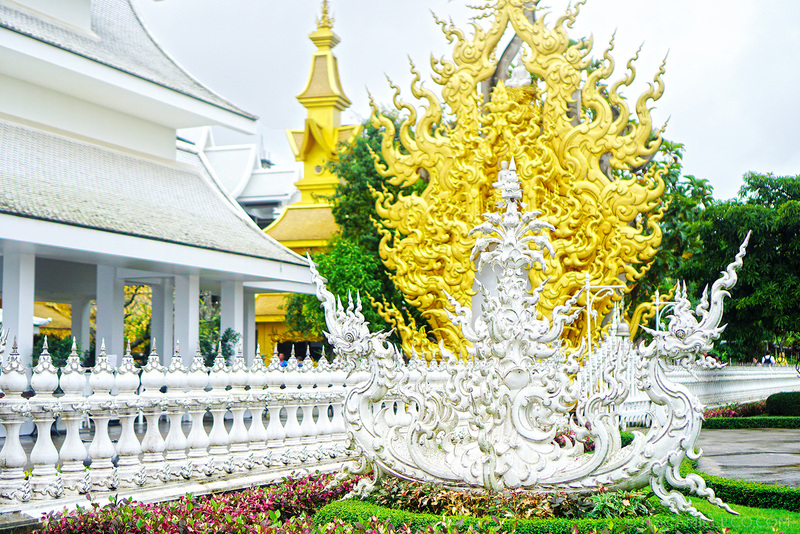 There’s still plenty of things to explore around the White Temple anyway. 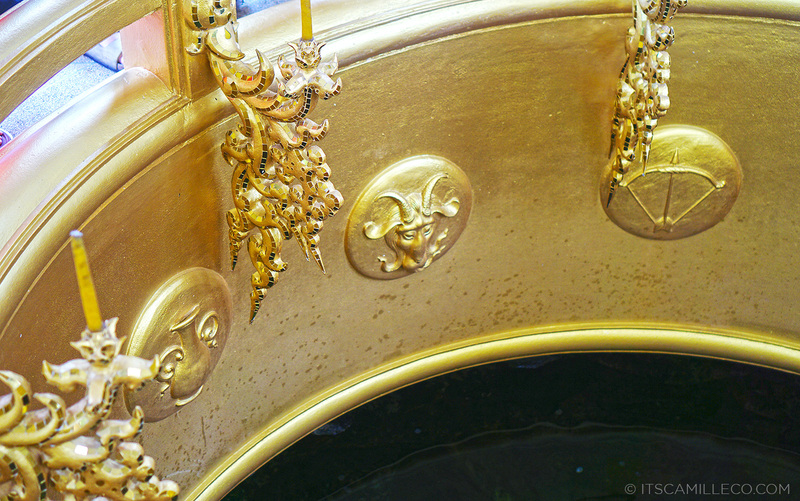 Just look at the restrooms housed inside the gold building in my photos below. 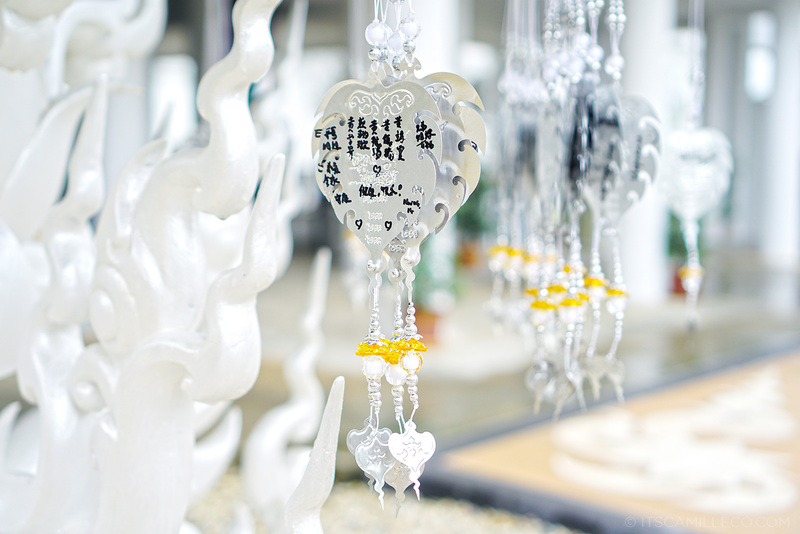 It’s the only structure that isn’t white to represent worldly desires and money and how they have little value in the end. 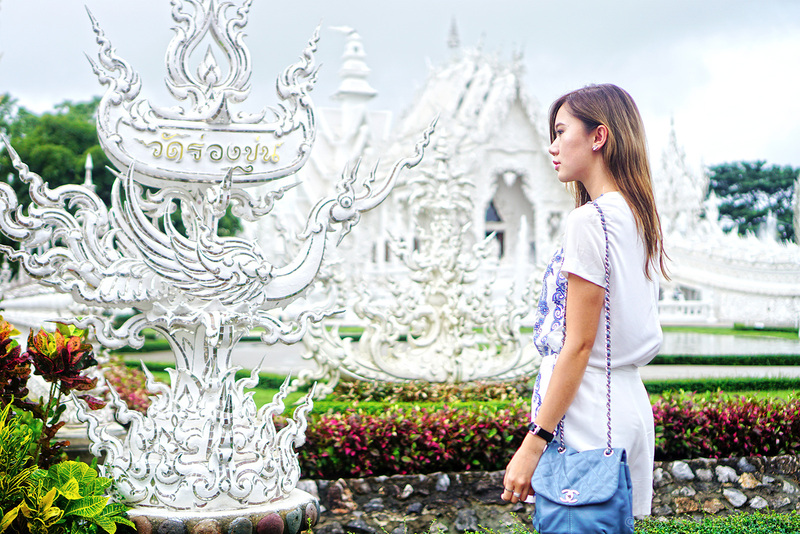 You see, the White Temple really makes visitors not only gaze at its beauty but ponder on life and Buddhist teachings as well. Of course, prior to coming here, I did my research. The fashion blogger in me wanted to match the surroundings well. I got inspired by the White Temples’ architecture so I wore this set from Jessica that features a nice blue pattern. 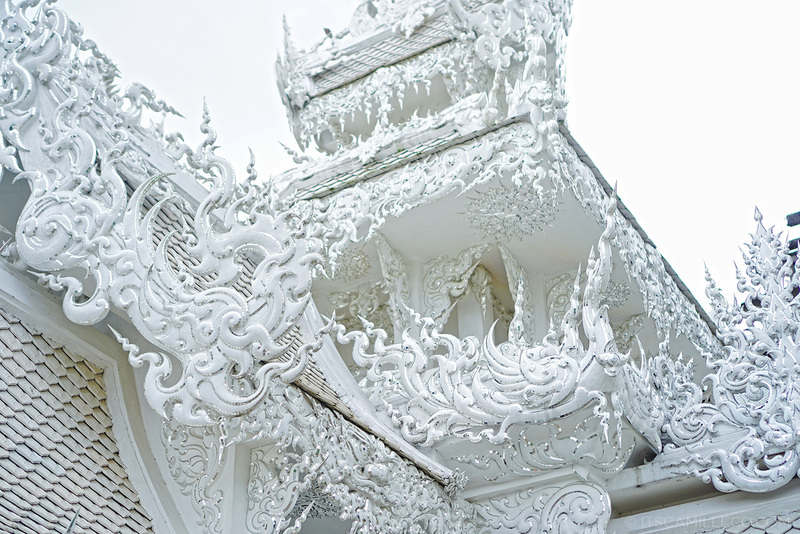 In my eyes, it kind of resembles the little details of the temple from afar and provides a subtle pop of color amidst all the white. As for my accessories, I kept them low key except for my Crystalline watch from Swarovski that’s made with 800 clear crystals. 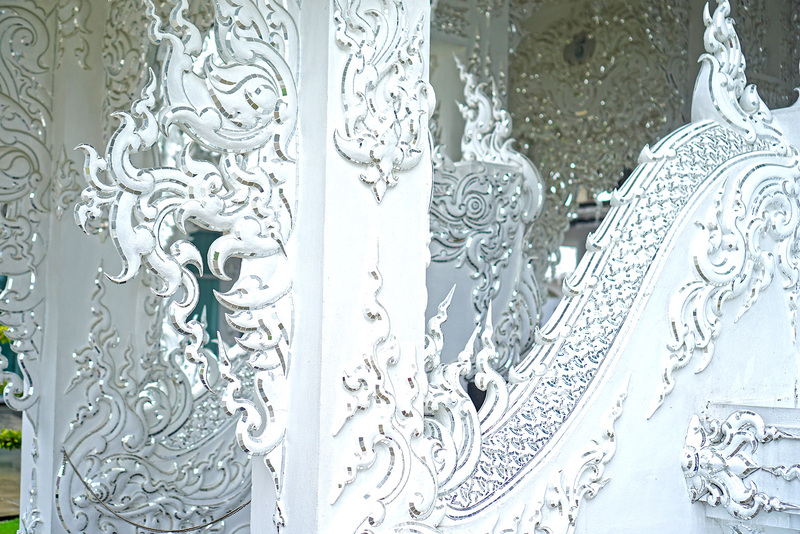 It’s my interpretation of the shiny pieces of glass embedded all over the White Temple. Don’t you think they go well together? 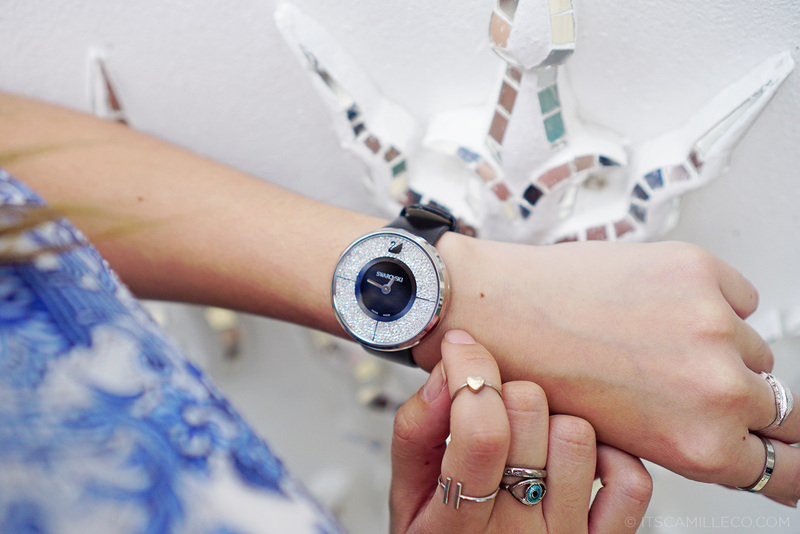 The Crystalline watch’s stunning design was made for a backdrop as beautiful as this! P.S. Don’t forget to join my awesome international giveaway wherein you can win a stylish leather jacket! Read all about it here. I love ur bag, I know it’s Chanel but do u know which one and where can I get it??? Sooo loving it!!! The photos and the architecture are devine. You are right, the pattern on your outfit is a great choice. I like that blue print pattern, it reminds me of a designer I can’t quite think of the name right now. Gorgeous! And your gladiator sandals, snakeskin!!!! I’m glad you took closeups for a better look. Nicely done! Hahahhaa! :) You are so funny! Thanks Dholls! Love the scenic shots.. love the outfit and most of all, love the Swarovski watch & the shoes! Thanks for sharing your travel diaries! Thanks Rochelle! :) Love my watch tooooo! Wala talaga akong masabi ate cams basta ikaw. Gusto ko din magtravel at magkaroon ng magagandang pictures.. They do! :) Thanks Justine! Thank you Bethany! It’s such a cool idea! I just kept saying wow the entire time too! 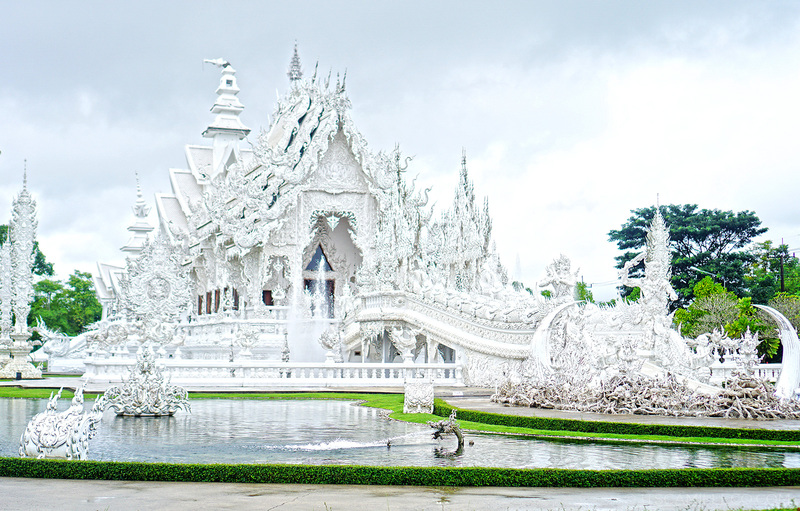 Your outfit is as beautiful as the White Temple!!! Haha! :) Sige dream na muna :) Thanks Vianney! Omg I love the coordinate and the photographs! The sandals are amazing. you blended well with the temple..haha! great pictures!! :) show more of your sister ate Camille! (if you just wanted to..)hehe..thanks! more blessings!!!! Thanks Mariel! :) If she allows me! Haha! One month? Such a long time! Welcome back! There are a lot of colors you can use naman. Maybe blush? Silver blue? Your outfit blends into the surroundings hehe! It’s cool! 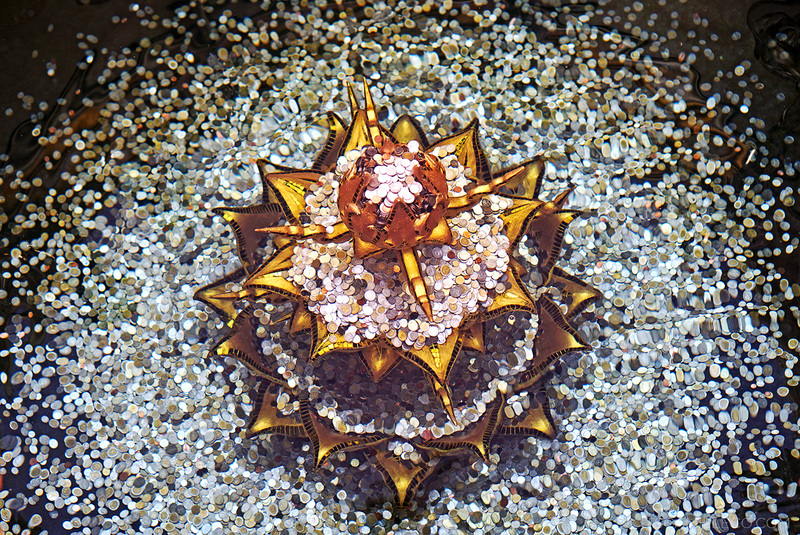 WOW, WONDERFUL PHOTOS!! I LOVE YOUR T-SHIRT! Oohh, I like that you corresponded your fashion with he architecture/history, it all the more incorporates you into the country. Wow, that is a lovely place, and pictures so cool! !